The Secret Recipe Club took a break in the month of December, but now we are back! For those who don’t know, the SRC is a fun blogging event in which you are paired (in secret) with another blogger, and on reveal day post a recipe chosen from that blog. Everyone in the same group posts at the exact same time, even if you are blogging from Japan. 😉 This month I was paired with Shirley, from the blog Enriching your Kid. Shirley is a clinical psychologist who, after having kids, opted for working very hard at home taking care of them and paying particular attention to a healthy nutrition. She cooks a lot of Indian food, so at first I had my mind set on one of her many paratha recipes, but then I spotted a very familiar Portuguese name – “bolo de fuba’ cremoso” – and that was it. I knew it would be my choice for the first SRC post of 2013. She added a nice twist to the classic, by incorporating pumpkin in the cake. Check out her post about it here. Pre-heat the oven to 350 degrees. Place all of the ingredients (up to the salt) in a blender or a food processor and mix for 4 minutes or until the mixture is smooth (it will be very liquid). If your processor or blender is very large, you can add the rest of the ingredients. Otherwise, transfer the mixture to a bowl and add the cheese, baking powder, nutmeg and lemon zest, mixing well with a whisk. Pour into a buttered and floured pan (8 x 8 inches). 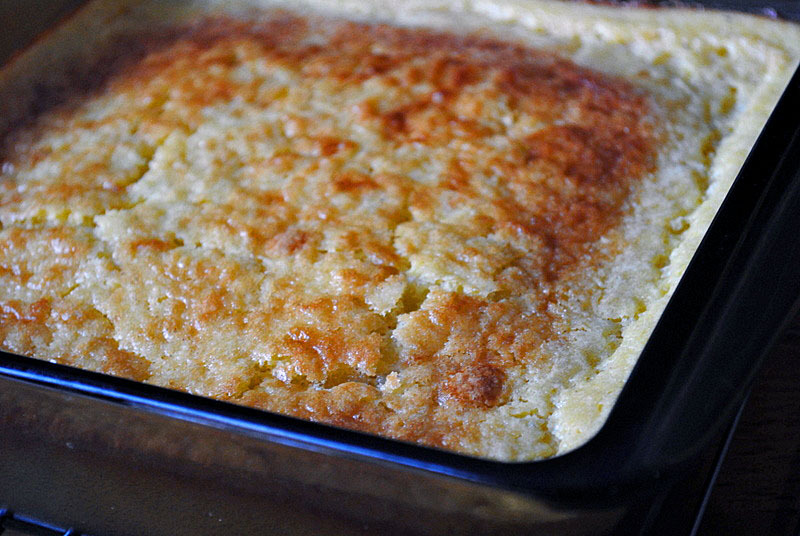 Bake for 35-40 minutes or until the top of the cake is golden. Cool the cake before cutting it into slices. Comments: First, a little bit on language, as Shirley was puzzled about the gender issue in Portuguese. All nouns have a gender, and for the most part words that end with “a” are feminine. Words that end with “o” are masculine. However, there are exceptions. Fuba’, for instance, the term that describes a particular type of corn flour, ends with “a“, but it is masculine. Therefore, the adjective that goes along with it, “cremoso” (creamy) must agree with the gender, and end with “o“. Let’s suppose we were talking about a coconut concoction called “cocada“. Cocada ends with an “a“, and it is indeed feminine. 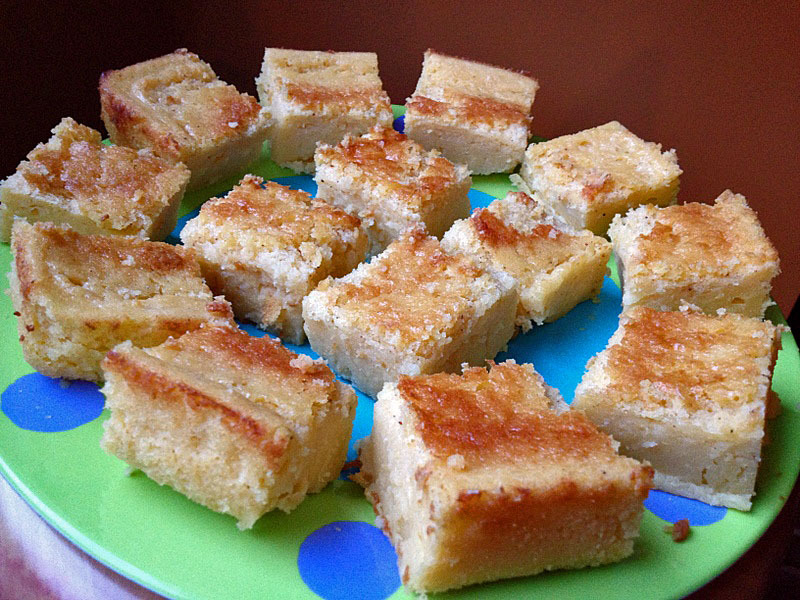 In this case, creamy coconut would be described as “cocada cremosa“. Clear as mud? Well, mud is feminine: A lama. Earth is feminine: A Terra. Love is masculine: O amor (gotcha there! Amor ends with “r” to confuse non-native speakers ;-)). Now, to the recipe: I made a few small modifications, using cooked pumpkin instead of raw. I absolutely had to put my beloved pumpkin puree to use, and that was a perfect opportunity. I also reduced the sugar slightly. 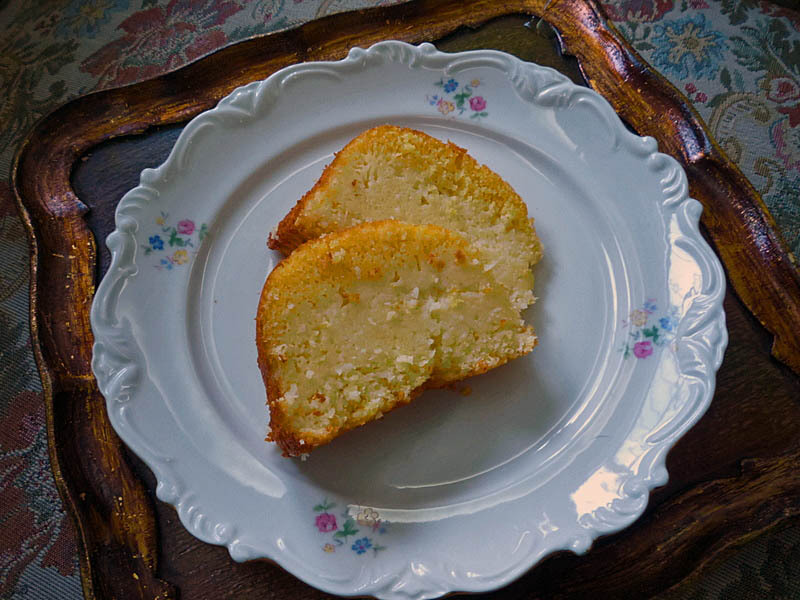 If you are Brazilian and grew up enjoying bolo de fuba’, this version seems like a different sweet, mainly because of the nutmeg. If you are not too fond of nutmeg, or if you want something closer to the Brazilian version, reduce the amount or omit it. 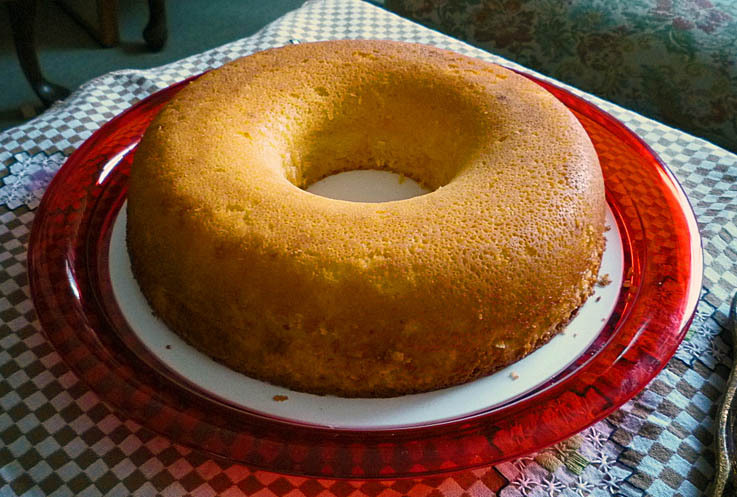 Pumpkin was a great addition to bolo de fuba’, I loved what its subtle taste brought to the cake. For my readers: if you want to see what the crowd from SRC Group D came up with in this first posting of the year, click on the happy frog and a new page will open with plenty of great posts.